September 7, 2017 – Today media sources reported that Netflix bought the new Ryan Murphy project “Ratched,” which will be an origin story based on the archetypal battle-axe nurse character from Ken Kesey’s novel and Milos Forman’s film One Flew Over the Cuckoo’s Nest (1975). The New York Times reported that Netflix has committed to at least two seasons and 18 episodes of creator Evan Romansky’s show. Production is planned to begin in 2018 and trace the title character’s “evolution from a low-level nurse into the severe, manipulative tyrant who terrorizes mental institution patients in Ken Kesey’s 1962 novel.” Variety reported that the story would start in 1947, and that longtime Murphy collaborator Sarah Paulson would play the title character. 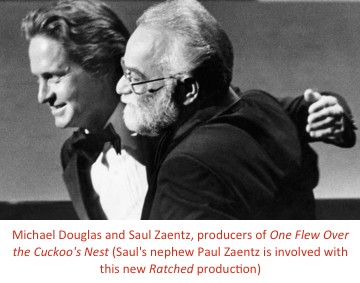 Among the producers is Hollywood star Michael Douglas, who was one of the producers of the original Cuckoo’s Nest film. Unfortunately, Nurse Ratched embodies the enduring battle-axe stereotype of nursing, the idea that any female nurse in authority must be a repressed maternal tyrant bent on torturing patients and emasculating innocent, freedom-loving men in order to resolve some unseen psychosexual damage in her own life. Deeply misogynous in its linking of female power with insidious oppression, the two-dimensional portrayal has spawned countless copies and variations in ensuing decades, right up to recent television shows like Grey’s Anatomy. Needless to say, it would take extraordinary skill and care to make a show about this character and not have it cause serious damage to nursing. Is that likely? Ryan Murphy’s track record on nursing does not inspire confidence; consider his damaging misportrayals on Glee (2). Of course, it would be a mistake to assume this is just another example of the blatant misogyny that appears to have overrun too much of the nation’s discourse over the last year or so, although we suppose that might help the show find an audience. Murphy has done thoughtful work and shown some concern for women’s issues and experiences. His aesthetic seems to reflect an interest in powerful, gloriously damaged females, for example in American Horror Story and Feud. But even if viewers need another hilarious portrait of twisted female malevolence, nursing does not. The battle-axe and other female-oriented media stereotypes have played a key role in the global nursing shortage that takes countless lives, especially through under-staffing; the world needs millions more nurses than it has been willing to pay for. In fact, nurses as a class are not sociopathic monsters, but college-educated science professionals of all genders who monitor, evaluate, educate, advocate for, and save patients in a wide variety of settings, such as university hospital burn centers where a critically injured patient might go after a vehicle crash. Research shows that too few nurses increases patient mortality–and that popular media stereotypes play a role in undermining nurses’ claims to respect and resources. 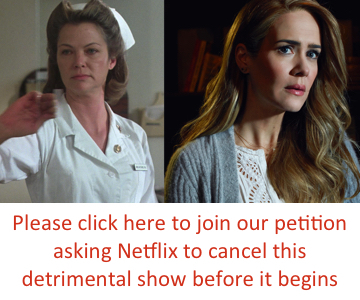 Please join us in urging Ryan Murphy, Netflix, and all involved to consider whether “Ratched” can be done without reinforcing a devastating stereotype of a life-saving profession. If it happens despite our objections, please urge them to reduce the damage by introducing some nuance in the title character — it’s possible: Nurse Jackie was fatally flawed and supremely talented — and featuring other nurse characters with some of the positive traits of real nurses, such as expertise, courage, decency, and so on. Thank you. Please click here to sign our petition! And please add your own comments to the show in the comments box to personalize it. Thank you! Also see MarySue Heilemann’s letter to nurses and supporters from January 25, 2018. Thank you! Hopefully, this shuts the show down. Just kidding. This is going to be a bomb show! Get updates and our newsletter.